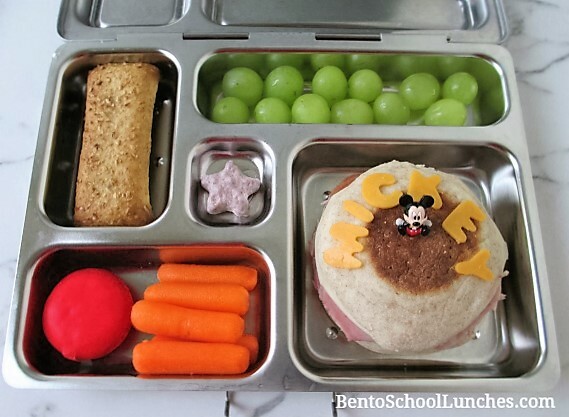 Bento School Lunches : Mickey Mouse Lunches - Happy Birthday MICKEY! 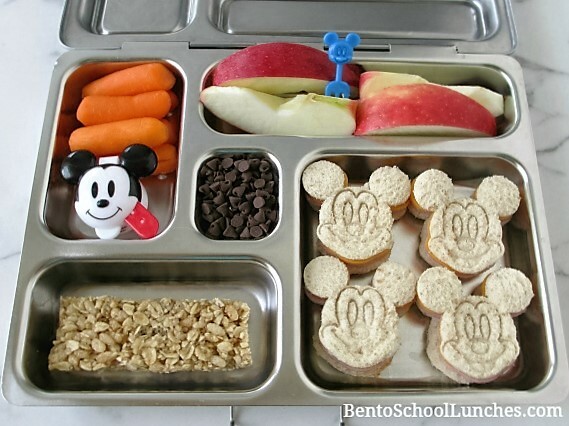 Mickey Mouse Lunches - Happy Birthday MICKEY! November 18th is Mickey Mouse's 88th Birthday! This gives me a chance to quickly pull out some Mickey themed lunches which I've not posted. We love Mickey Mouse, and have the privilege of visiting Walt Disney World at least a couple of times a year. We live in Florida, and for us it's not too far from Disney World and many other great theme parks. Here are the lunches which Nikolai enjoyed many months ago. Both are packed in our favorite stainless steel and durable Planetbox. In this bento lunch: Main compartment contains a few Mickey stamped sandwiches which I created with my cutter/stamper. Sides were organic granola bar, mini choc chips, organic baby carrots with dip in the small Mickey container and organic apple slices with a cute Mickey pick. In this bento lunch: An English muffin with MICKEY cheddar cheese lettering created with my alphabet cutter and a cute Mickey pick. Sides are organic baby carrots, Babybel cheese, cereal bar, yogurt covered star and seedless green grapes.